Q. Why are our strings better than others? 1. We have our own steel, but have 2 other types to use at our discretion. 2. We have 3 types of copper - Our secret! - To use at our discretion. 3. We can make strings for different time periods, using the authentic iron/puresound/steel as appropriate. 4. We can wind the strings with one of 3 coppers or 3 different authentic brasses, soft iron, or tin plated copper. 5. We will rescale all our strings, unless otherwise requested, by experience and mathematics as we know the different density figures of the various materials and scale differently for English, German and French Pianos to get the best results. 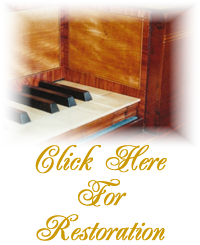 In addition we actually listen critically to the tone of our own strings on selected pianos. 6. We have the skills to make perfect matching eyes to different lengths according to the piano and also German single and double eyes. 7. We can manufacture Bechstein whips on both ends of strings, combine Bechstein or Steinway whips on one string and make authentic Bosendorfer whips on selected pianos. 8. Our strings are very clean and polished. 9. All our craftsmen are highly trained. 10. We keep complete records of every set made so that should you need a replacement in years to come, we can make a perfect match. 11. We also offer an expert in-house restringing service - Try us for quality and efficiency. 12. We export to the USA, Europe and the Far East and would be pleased to help you wherever you are. For more help please feel free to contact us.